Birthplace : Tuskegee, Alabama, U.S.
Rosa Louise McCauley Parks, born on February 4th, 1913 and died on October 24, 2005, was an African American civil rights activist whom the U.S. Congress later called the Mother of the Modern-Day Civil Rights Movement. On December 1, 1955 in Montgomery, Alabama, Parks, age 42, refused to obey bus driver James Blake’s order that she give up her seat to make room for a white passenger. Parks’ act of defiance became an important symbol of the modern Civil Rights Movement and Parks became an international icon of resistance to racial segregation. She organized and collaborated with civil rights leaders, including boycott leader Martin Luther King, Jr., helping to launch him to national prominence in the civil rights movement. At the time of her action, Parks was secretary of the Montgomery chapter of the National Association for the Advancement of Colored People (NAACP) and had recently attended the Highlander Folk School, a Tennessee center for workers’ rights and racial equality. Parks eventually received many honors ranging from the 1979 Spingarn Medal to the Congressional Gold Medal, a posthumous statue in the United States Capitol’s National Statuary Hall. Her death in 2005 was a major story in the United States’ leading newspapers. She was granted the posthumous honor of lying in state at the Capitol Rotunda. Parks resided in Detroit until she died at the age of 92 on October 24, 2005, about 7:00PM EDT, in her apartment on the east side of the city. She had been diagnosed the previous year with progressive dementia. Parks received most of her national accolades very late in life, with relatively few awards and honors being given to her until many decades after the Montgomery Bus Boycott. In 1979, the National Association for the Advancement of Colored People awarded Parks the Spingarn Medal, its highest honor and she received the Martin Luther King Jr. Award the next year. 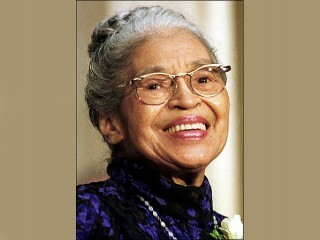 She was inducted into the Michigan Women's Hall of Fame in 1983 for her achievements in civil rights. In 1990, she was called at the last moment to be part of the group welcoming Nelson Mandela, who had just been released from his imprisonment in South Africa. Upon spotting her in the reception line, Mandela called out her name and, hugging her, said, "You sustained me while I was in prison all those years." In 1992, she received the Peace Abbey Courage of Conscience Award along with Dr. Benjamin Spock and others at the Kennedy Library and Museum in Boston, Massachusetts. On September 9, 1996, President Bill Clinton presented Parks with the Presidential Medal of Freedom, the highest honor given by the U.S. executive branch. In 1998, she became the first recipient of the International Freedom Conductor Award given by the National Underground Railroad Freedom Center. The next year, Parks was awarded the Congressional Gold Medal, the highest award given by the U.S. legislative branch and received the Detroit-Windsor International Freedom Festival Freedom Award. Parks was a guest of President Bill Clinton during his 1999 State of the Union Address. That year, Time magazine named Parks one of the 20 most influential and iconic figures of the twentieth century. In 2000, her home state awarded her the Alabama Academy of Honor, as well as the first Governor's Medal of Honor for Extraordinary Courage. She was awarded two dozen honorary doctorates from universities worldwide, and was made an honorary member of Alpha Kappa Alpha Sorority, Incorporated. The Rosa Parks Library and Museum on the campus of Troy University in Montgomery, was dedicated to her on December 1, 2000. It is located on the corner where Parks boarded the famed bus. The most popular items in the museum are the interactive bus arrest of Mrs. Parks and a sculpture of Parks sitting on a bus bench. The documentary Mighty Times: The Legacy of Rosa Parks received a 2002 nomination for Academy Award for Documentary Short Subject. She collaborated that year in a TV movie of her life starring Angela Bassett. In 2002, scholar Molefi Kete Asante listed Parks on his list of 100 Greatest African Americans. On October 30, 2005, President George W. Bush issued a proclamation ordering that all flags on U.S. public areas both within the country and abroad be flown at half-staff on the day of Parks' funeral. Metro Transit in King County, Washington placed posters and stickers dedicating the first forward-facing seat of all its buses in Parks' memory shortly after her death, and the American Public Transportation Association declared December 1, 2005, the 50th anniversary of her arrest, to be a "National Transit Tribute to Rosa Parks Day".